Students explore the life cycle of a plant, develop an awareness of changing seasons, and grow in their appreciation of fresh food. In the fall, kindergartners might be picking pumpkins, munching on sunflower seeds, or exploring the sense of taste and smell in the herb garden. 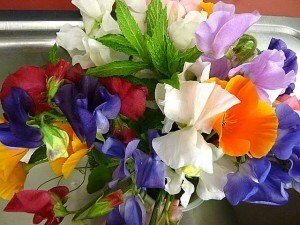 In the springtime, the students dig up potatoes around St. Patrick’s day, sample different color lettuces, and gather sweet pea blossoms for classroom bouquets. The students enjoy hands-on learning when all five senses are engaged with the sights, sounds, smells, taste, and touch of plants, pollinators, soil, and seeds. The Garden is located behind the kinder classrooms. Parent volunteers help with the care, maintenance, and education of the garden. If you are interested in getting involved, please contact one of the kindergarten teachers.